We had some unwanted attention last Saturday night. 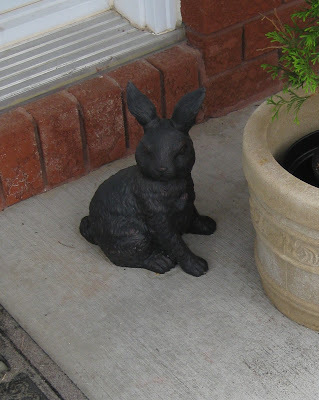 My cast iron bunny was the only witness it seems. Unfortunately I can't get him to tell me what he saw. Around 12:30am some vandals decided to ring our door bell (daaa?????) 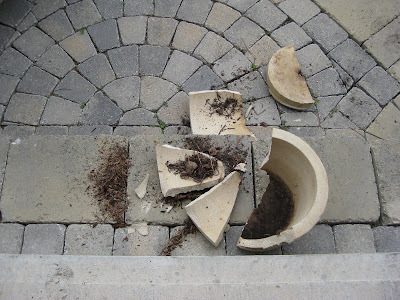 and then smash my nice stone planters on my walkway. I tried some "Gorilla Glue" to repair the damage, but it just didn't look right so I went out and bought some new planters today. I really liked my old planters . . . but I am thankful they were not thrown through my front door or living room window. I bought some light fibreglass ones today. They can't do any damage when airborne. 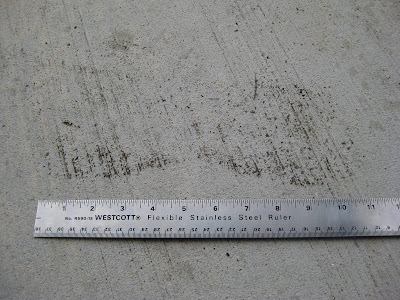 You can see from the muddy foot print on my porch that the thug was pretty big. I like having a big dog! She looks nice and calm in all my pictures but trust me . . . she won't let anyone mess with her mum. Here she is . . . shortly after our scare . 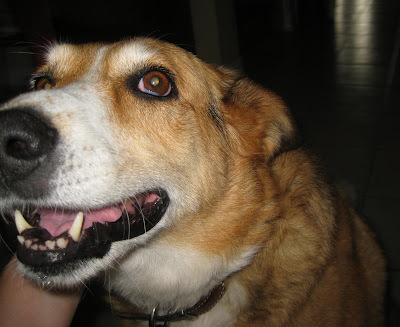 . . getting lots of "good girl" pets. P.S. We do live in a good neighbourhood. Really. Just some stupid teenagers carrying out their twisted idea of fun. My husband and I had a long chat about that with our own soon to be teenagers. Yes. there is fun but always teach your children not to destroy others property.... Good clean fun is just that. What happened to you is not good. Makes you just a tad leary also.... Glad it all worked out with hopes of no more goings on. Have a peaceful but enjoyable Fouth. That is just ridiculous! Well, that's too bad about the stone planters. I'm glad it wasn't much else. Sorry to hear that you had an awful experience the other night. It leaves you with a horrid feeling to think that there are people out there that would do that. When we were away my daughter was out walking on Saturday afternoon and some kids in a jeep stopped and a young guy smacked her on the bottom. She was so upset at them doing this and reported it to the Police. The jeep had a distinctive wheel cover on the back with San Francisco on it. On Monday, we saw it parked in the carpark and my husband was able to talk to the Father who was going to talk to his kids. Sorry I went on, but there are kids out there that do not know how to behave. Happy 4th of July to your Family. That's just awful - have kids got nothing better to do!! These goons have obviously not seen how protective Cider is of you LOL! They wouldn't be so quick to come around if Cider was outside. I'm glad that no one was hurt! Sorry to hear that someone did something so terrible. Good girl Cider for being a good watch dog! Princess Lace Gown and more . . .